Only 2 left. First 2 orders get it. Fully functional for delicate work, very sharp points. Great for crafts, fine needlework or iris snipping. Just not so pretty as the first quality ones we're selling. 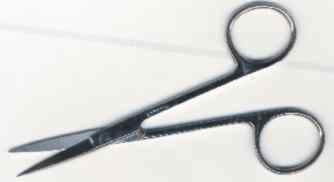 Stainless steel Iris Scissor 4-1/2" Curved - Seconds - small cosmetic flaws with no functional effect - and not an item we normally sell so we are offering them for below cost. A terrific deal while they last.